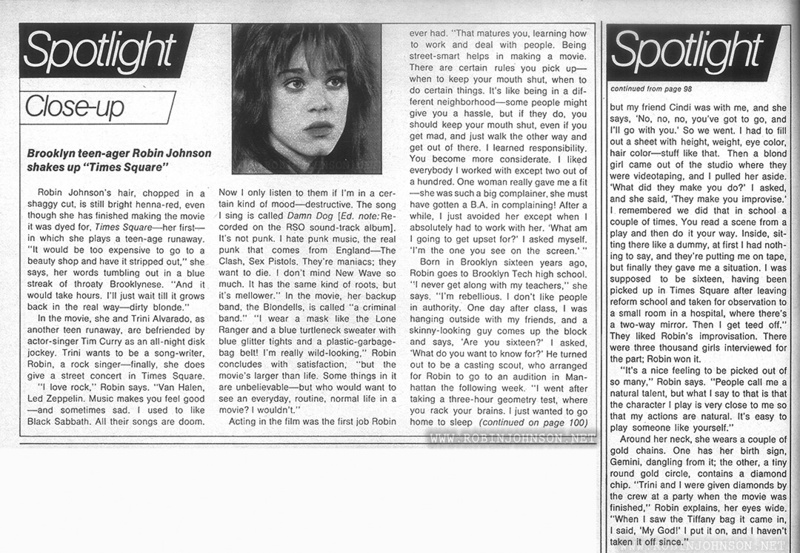 Posted on 11th February 2016 in "Times Square"
Again presuming that any magazine dated October probably came out in September before the movie opened, here’s an interview with Robin that appeared as two pages of Edwin Miller’s “Spotlight: Movies, records, personalities” column. The full column led off on page 93 with a look at Breaking Glass and a picture of Hazel O’Connor, but that’s where the similarities with the Film Review article end. Where that article was edited from various pages of the Press Kit, this one looks to have been the product of a genuine one-on-one interview with Robin. She explains how she hates punk rock, the story of her “discovery” has a few details that I don’t think are repeated anywhere else, she describes her audition… but how reliable these details are is a little questionable, since she mentions encouragement from her friend Cindi, and I’m fairly certain that’s actually a reference to her sister Cindy. I also don’t think the accompanying picture ever appeared anywhere else. 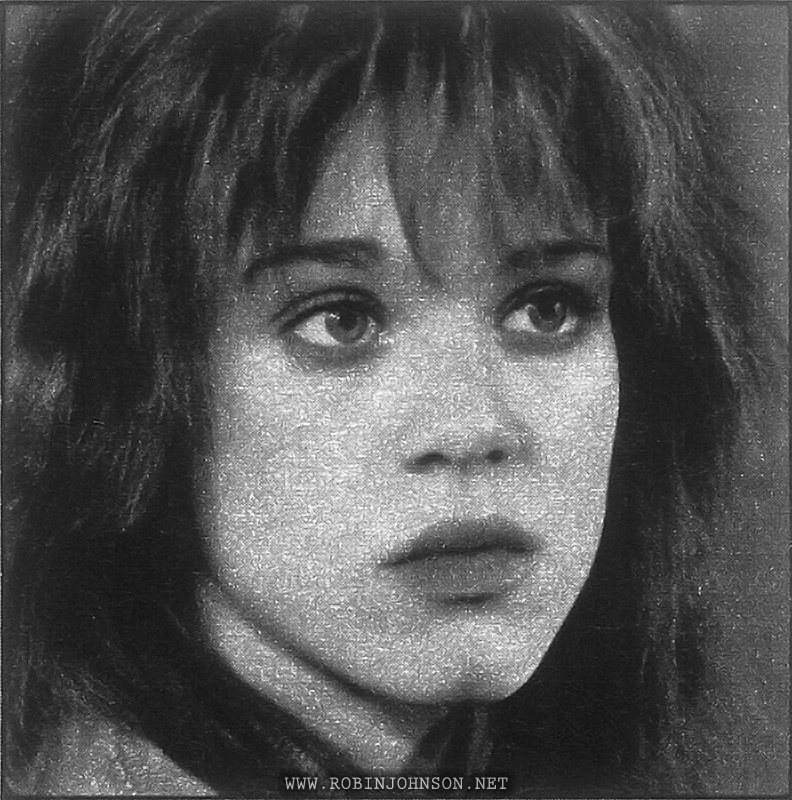 In the movie, she and Trini Alvarado, as another teen runaway, arc befriended by actor-singer Tim Curry as an all-night disk jockey. Trini wants to be a song-writer. Robin, a rock singer — finally, she does give a street concert in Times Square. Born in Brooklyn sixteen years ago, Robin goes to Brooklyn Tech high school. “I never get along with my teachers,” she says. “I’m rebellious. I don’t like people in authority. One day after class. I was hanging outside with my friends, and a skinny-looking guy comes up the block and says. 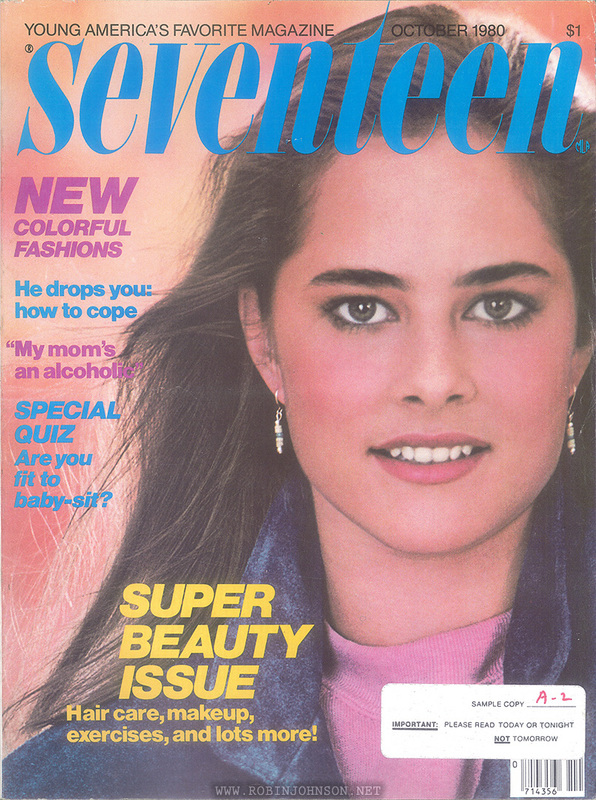 ‘Are you sixteen?’ I asked, What do you want to know for?’ He turned out to be a casting scout, who arranged for Robin to go to an audition in Manhattan the following week. “I went after taking a three-hour geometry test, where you rack your brains. I just wanted to go home to sleep but my friend Cindi was with me, and she says. ‘No. no. no. you’ve got to go. and I’ll go with you.’ So we went. I had to fill out a sheet with height, weight, eye color, hair color—stuff like that. Then a blond girl came out of the studio where they were videotaping, and I pulled her aside. ‘What did they make you do?’ I asked, and she said. ‘They make you improvise.’ I remembered we did that in school a couple of times. You read a scene from a play and then do it your way. Inside, sitting there like a dummy, at first I had nothing to say. and they’re putting me on tape, but finally they gave me a situation. I was supposed to be sixteen, having been picked up in Times Square after leaving reform school and taken for observation to a small room in a hospital, where there’s a two-way mirror. Then I get teed off.” They liked Robin’s improvisation. There were three thousand girls interviewed for the part; Robin won it. 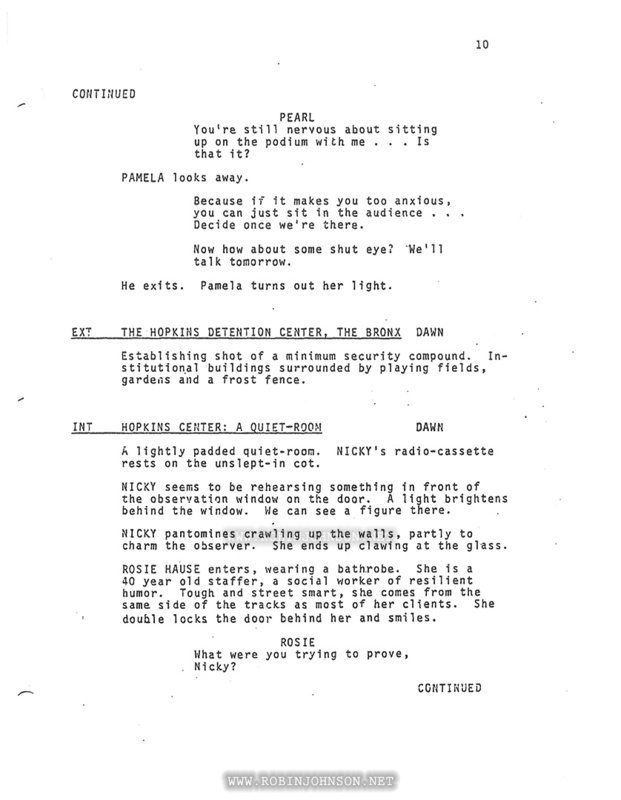 The scene she says she was given to improvise for her audition, in the room with the two-way mirror, is in the script and may even have been shot (there’s a photo that looks like it, published in an article I haven’t got to yet), but doesn’t appear in the film. This image above of the interview looks almost identical to the one Bernadette McCallion gave me years ago, which I posted and which has been floating around the Web since, but it’s not – it’s a new scan made by me. Although, in comparing the two, I probably needn’t have bothered; hers is almost identical. It turns out pasting the parts of the two pages together like that is the best way to display them.